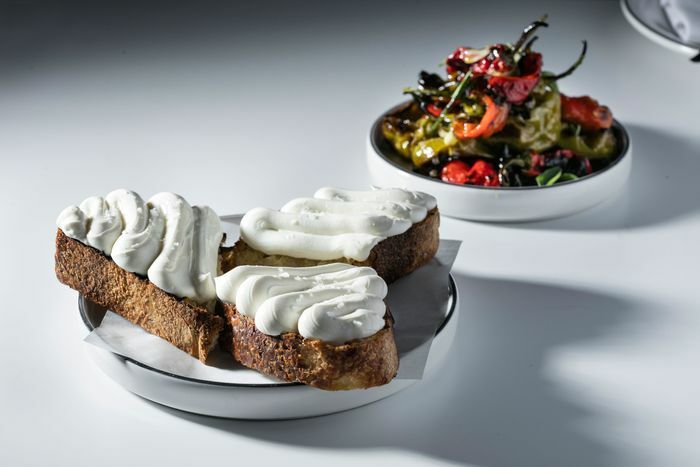 Has Missy Robbins stripped down Italian cuisine too much for jaded New York palates? Like many chefs who’ve successfully navigated their way through the great culinary upheavals of the last several years (the comfort revolution, the great gourmet apocalypse, etc. ), there’s been a sense, as you look at the course of Missy Robbins’s long and successful career, of a steady editing, adapting, and paring down. 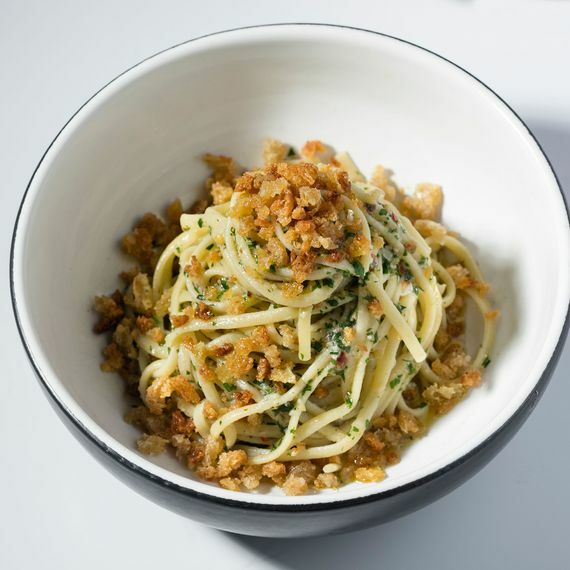 At the award-winning A Voce restaurants, where Robbins set up shop in New York after making her name at Spiaggia in Chicago, she demonstrated a talent for taking shopworn recipes from the Italian canon — for gnocchi, for pasta carbonara, for carne cruda — and standing them on their heads in all sorts of elevated, gourmet ways. 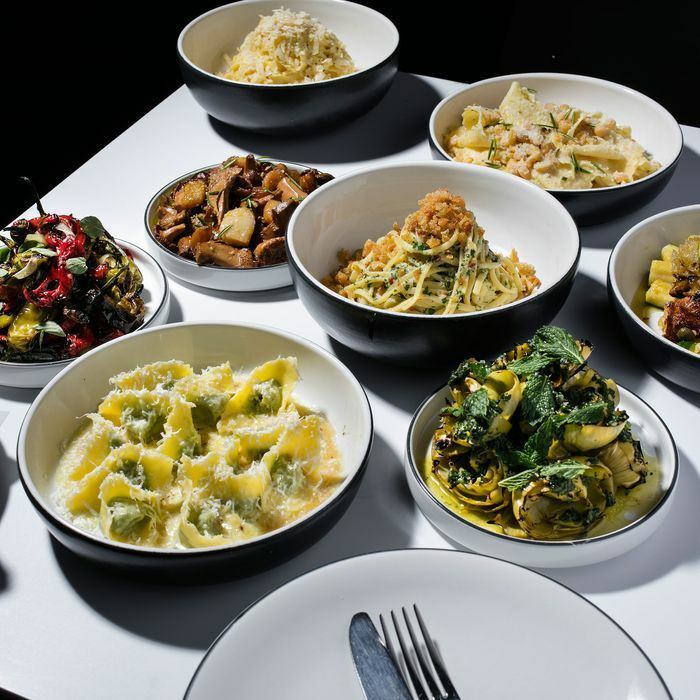 At her next restaurant, Lilia, in Williamsburg, the dishes tended to be smaller, more focused and more user-friendly, and designed (like the famous cacio e pepe fritters, the “little fish” platters of grilled clams, the mini-sized bowls of agnolotti stuffed with sheep’s-milk cheese) to be consumed with drinks, or as snacks, amid a clatter of convivial conversation. 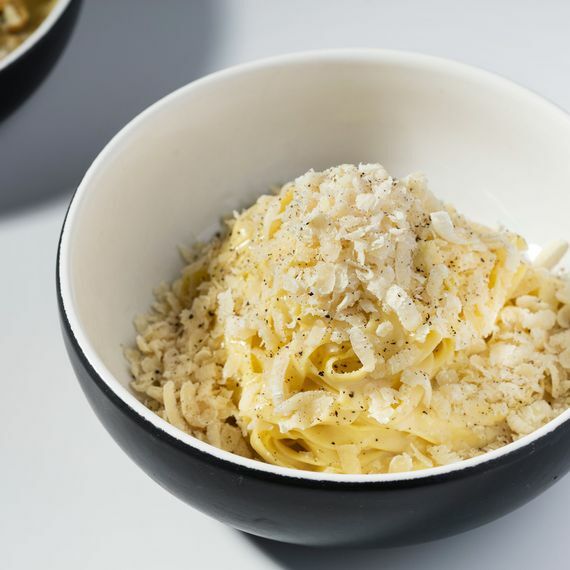 At her new vegetable and pasta-themed venture, Misi, which opened a couple of months ago in a clean, boxy space down on the south Williamsburg waterfront, Robbins continues this trend towards minimalism and functionality to an almost extreme degree. There are not one but two long dining counters in the back of the room, one which curves around the open kitchen, the other around the bar. The walls are lined here and there with strips of white industrial brick, the tables are topped with a shiny white Corian, and the floors are covered with the kind of gray cement tiling you might see in a modish industrial cafe. There’s a clean, utilitarian “pasta room” glassed off next-door to this dining space, where the house pasta makers arrive each morning to begin churning out the twirls of spaghetti, thick strands of “strangozzi”, and wide sheets of eggy pappardelle that are served every evening in sturdy porcelain bowls. In keeping with this reductionist philosophy, there are ten pasta compositions on the single-page menu at Misi which are designed to be enjoyed with ten vegetable antipasti dishes, all of them prepared in a variety of seasonal, deceptively sophisticated, Italianate ways. 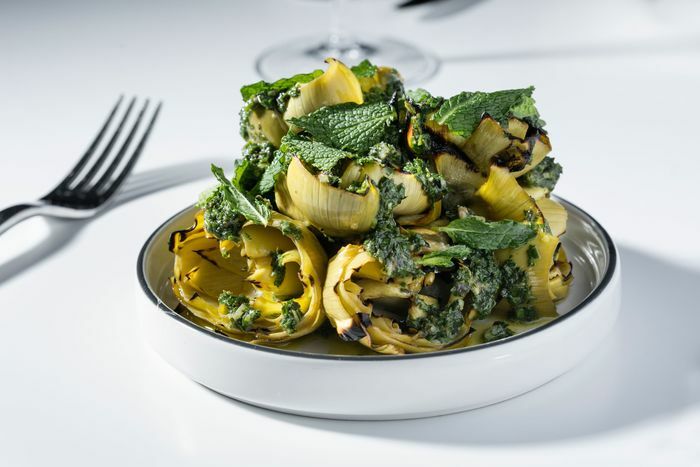 Shortly after sitting down at our table, we took delivery of a decorous pile of baby artichokes braised in a variety of flavors (white wine, olive oil, orange peel), then finished with a splash of salsa verde and little tearings of fresh mint. 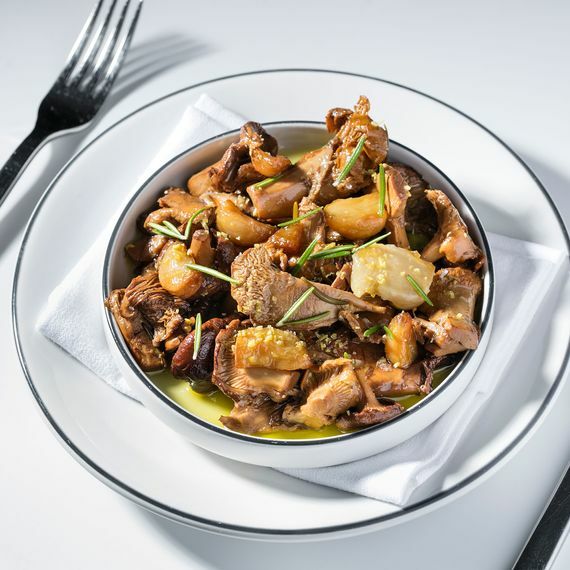 There were also knuckle-sized chanterelles in this same flight of dishes, tossed like little chunks of steak, with rosemary and soft bulbs of garlic, and a toppling little mound of charred baby peppers — red lipstick peppers, green shishitos — which the kitchen marinates in vinegar, among other things, and serves with thick cuts of fresh-toasted country bread covered with smooth, cream-colored waves of whipped ricotta, which looked like they’d been spooned from a jar of Marshmallow Fluff. “This is not my dad’s kind of Italian restaurant,” one of the young pasta scholars at our table says as more vegetable antipasti — grilled runner beans; fennel and celery; leeks with anchovies — keep arriving without a sliver of prosciutto di parma, or refrigerated, out-of-season tomato, or even a finger bowl of crunchy, comforting cacio e pepe fritters in sight. 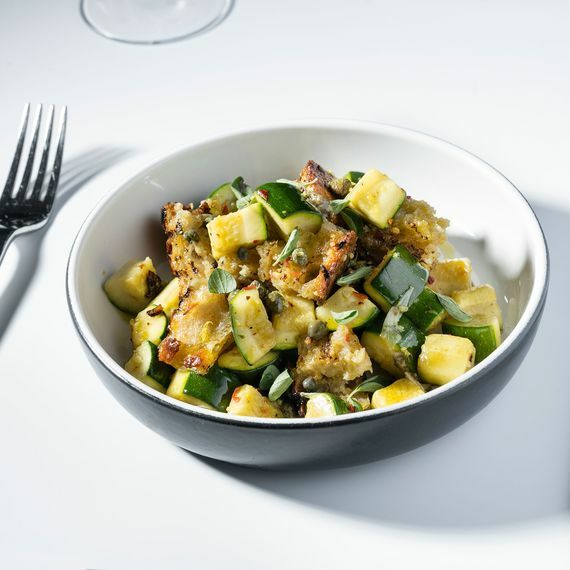 I could relate to poor old dad, I have to say, especially since it’s the critic’s grim duty to sample a little of everything, instead of lingering over those baby artichokes, say, or the little cubes of zucchini (tossed with capers, oregano, and chunks of grilled bread) before moving on to the pasta portion of dinner. But on my visits, the familiar, slightly numbing parade of Mediterranean flavors (olive oil, garlic, lemons, capers, balsamic) tended to blend together, and was interrupted only by the different tastes and textures of the vegetables themselves, which also included a worthy stack of romano beans, for the record, and a large baked eggplant, touched with Calabrian chile, which we were instructed to eat with our spoons. Clockwise from top: charred peppers with whipped-ricotta crostini; olive-oil-poached zucchini with grilled bread; and chanterelles sott'olio. Photo: Melissa Horn. Not that there was anything wrong with these soft scoops of eggplant, mind you, although when the pasta portion of dinner finally arrives, it does little to alleviate the gathering sense of slightly mechanical, one-note monotony. 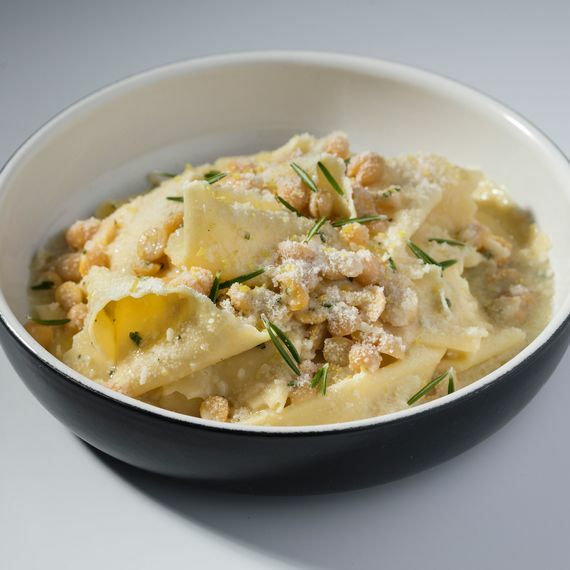 “This is like Olive Garden for sophisticated New Yorkers,” whispers one of the hypersophisticated New Yorkers at the table, as we worked our way diligently through sheets of eggy pappardelle (coated quite deliciously with chickpeas, garlic, and fresh rosemary), twirls of perfectly al dente linguine folded with breadcrumbs and anchovies (delicious, also), and a rich, buttery fettuccine preparation, which tasted like a version of fettuccine Alfredo for the post-millennial set. 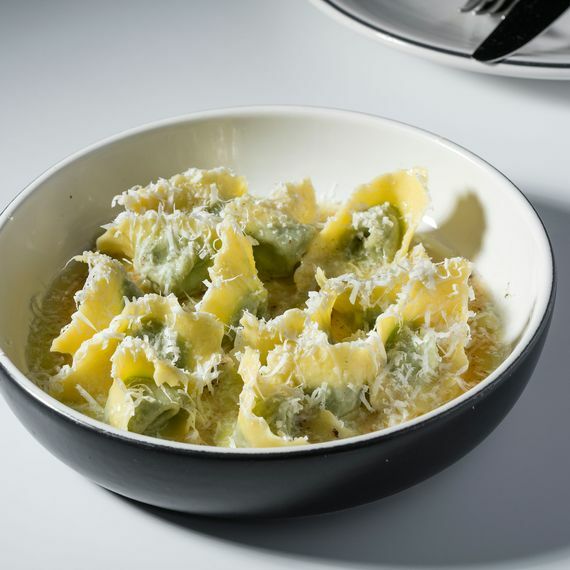 But the real stars of the show, it was generally agreed, were the dumplings, like the round little occhi (filled with sheep’s-milk ricotta tinged with bottarga), and the creamy green spinach-and-mascarpone tortelli, which are served, for an extra added dose of richness and pleasure, in a thin pool of brown butter. If it’s on the menu (and if dad happens to be with you, and has $115 burning a hole in his pocket), you can anchor this little avalanche of carbohydrates with the well-aged fiorentina steak special, which weighed in at 45 ounces on the evening I enjoyed it, and was sprinkled, in the Florentine style, with drifts of rosemary, sea salt, and fennel pollen. There are also plenty of drinkable cocktails available at the crowded bar (the negroni sour, a professionally made martini with “olive-oil-washed” Beefeater gin), along with a modest but well-chosen list of champagnes and mostly biodynamic wines from vineyards in and around Italy. 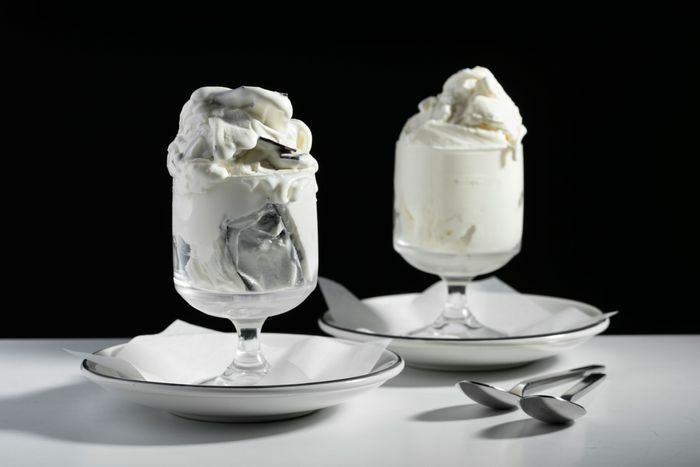 In keeping with the restaurant’s reductive (and, it must be noted, easily duplicated) formula, only gelato is offered for dessert, and since there are six smooth, generally well-crafted flavors to choose from (try the olive oil, the fior di latte, and the mint stracciatella), it’s possible to order them all and test each one yourself, one by one, just like a weary critic. Clockwise from top left: spinach-and-mascarpone tortelli; linguine with anchovy and colatura; fettuccine with buffalo butter and Parmigiano-Reggiano; and chickpea pappardelle. Photo: Melissa Horn. Prices: Antipasti, $13 to $18; pastas, $19 to $26. Ideal Meal: Antipasti: charred peppers, chanterelles, zucchini and/or baby artichokes; pasta: spinach tortelli, fettuccine with buffalo butter, chickpea pappardelle, linguine with anchovies; gelato: olive oil, mint stracciatella. 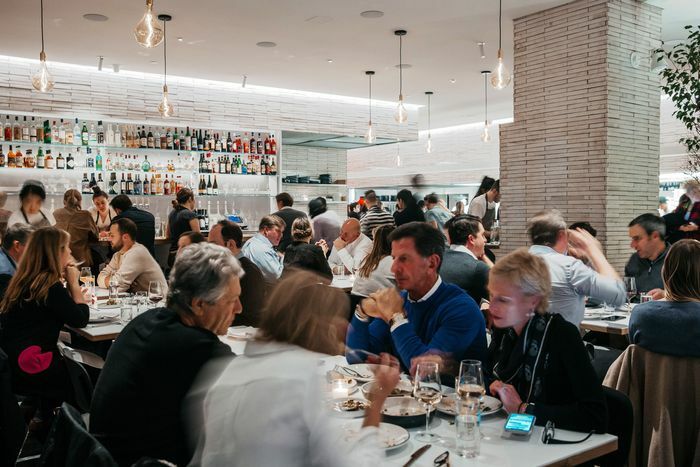 Note: With the holiday restaurant season in full swing, reservations are especially difficult to come by, so your best bet is to go early (or late), and fight for a seat at the bar. Scratchpad: Half a star each for the vegetables and the gelato, and a full star for the pastas (although here’s hoping the cacio e pepe fritters make their way onto the menu someday).